This weekend has been a roller coaster of emotions. Drew goes from cranky to happy frequently, depending on how much sleep he gets as well as how much pain meds he’s on. But, he’s going longer and longer periods of time without pain medication. I just can’t wait until I don’t have to look into his pained face and desperate whimpers. Drew took his first outing today, much to our delight. He had been resting in the recliner since the minute that he had gotten home from the hospital so we were anxious to get him out in the sun and fresh air. He fed some ducks in a pond behind our building. Part of our daily routine is cleaning the pins, ridding them of dried blood and other such icky stuff. It’s not pleasant for Drew. Although today’s session was a huge success. He actually stayed pretty calm throughout most of the cleaning even saying at times that “it tickles!” We have to wear sterile gloves and use saline-solution soaked gauze to wipe each of the pins down. It was during tonight’s session that I actually realized that there are four pins that actually impale his leg in one side and come out the other. I had though they were eight pins drilled into his leg, but oh no…it’s four pins that skewer his leg through and through! UUUUuuuuuughh!! Always a celebration when Daddy’s done! Tomorrow we get to give Drew his first shower. Throughout the weekend we had to resort to using a non-rinsable foam. Yaya (Mother in Law) and I searched all over town for an acceptable shower seat for Drew as we were told that the fixator would damage the tub itself. I sure am glad that we did this fundraising and it did so well because I completely underestimated what it was going to take to pull this off. 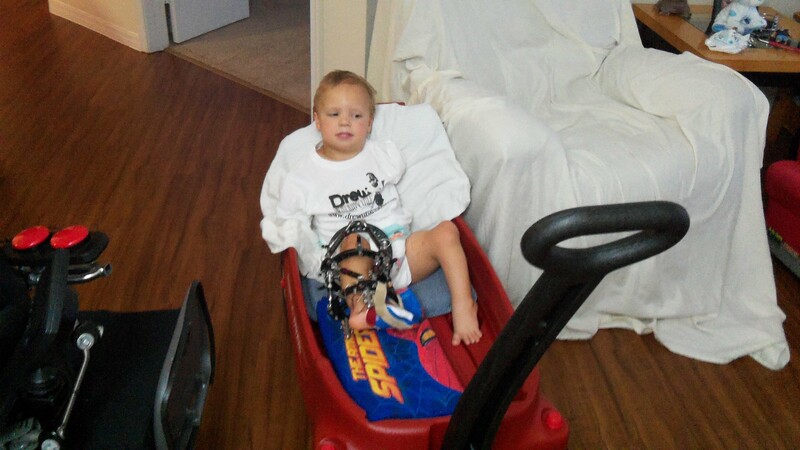 We’ve had to purchase so many adaptive devices for Drew. I spent a greater majority of today altering shorts so they velcro shut on the right side so he can wear pants in public. Prior to our trip to Florida, I had expressed relief that I wouldn’t be so anxious for the second surgery as I was the first. Sometimes knowing what’s coming up can be a plus. But, I’m not so sure in this case. Knowing that I’m going to have to, once again, witness Drew’s worst moments in pain and terror…I really dread doing it all over again. I know that we should be looking forward to the end of this trial, but it’s so hard to this early in the game when it’s the hardest. Tomorrow is our first physical therapy appointment and the first “turning of the pins.” Please keep Drew on your minds tomorrow and pray that he has minimal pain. Thanks! Stacy and I are proud if Drew for putting up with all of this. And we cannot imagine what you and Nathan are going thru. I can only imagine what its like to see him in pain and not be able to fix it. Tell Drew we love him and we are waiting for him to cone home, and Conner misses him also.